在使用 WinPE PXE (Linux PXEBoot – http://benjr.tw/917 , Windows RIS / WDS – http://benjr.tw/279 , WDS – http://benjr.tw/100848 )安裝 Windows 時會搭配不同的 unattend.xml (Answer file) 來自動安裝. 那 startnet.cmd 在哪裡?先來簡單看一下 WinPE 的架構. 先透過指令 copype 建立一個 WinPE 工作環境 (平台可以選擇 x86 , amd64 , arm , arm64, 路徑 c:\WinPE 自訂),在程式集 Windows kits 點選 Deployment and Imaging Tools Environment. 如果要修改 boot.wim 內容需要透過指令 DISM (Deployment Image Servicing and Management) – 指令需要有 administrator 權限,可以透過 command prompt (run as adminstrator).把 Windows images 映像檔 boot.wim 掛載起來. 在 startnet.cmd 裡面的指令 wpeinit 是做什麼的? 微軟官網寫 Wpeinit.exe 將安裝即插即用設備,處理 Unattend.xml 並加載網路資源. 為了讓 WinPE 自動安裝 Windows 作業系統,需要在 startnet.cmd 編寫以下的內容,為最基本的 Bat 批次檔. 正式拿到 PXE 測試前,可以先做成 ISO 透過虛擬機來試試. RedHat / CentOS 安裝完成之後在 root 資料夾會留下當初安裝的設定檔 anaconda-ks.cfg (自動安裝設定檔 kickstart),雖然是文字檔但編輯起來還是很累人的. RedHat 提供了一隻工具 (#system-config-kickstart) 可以讓我們透過勾選選單的方式來設定安裝時的設定值. Windows 的 unattend.xml 就如同 Linux 的 kickstart , unattend.xml 雖然可以用文字編輯來編輯,不過還是建議使用 Windows System Image Manager (Windows SIM). 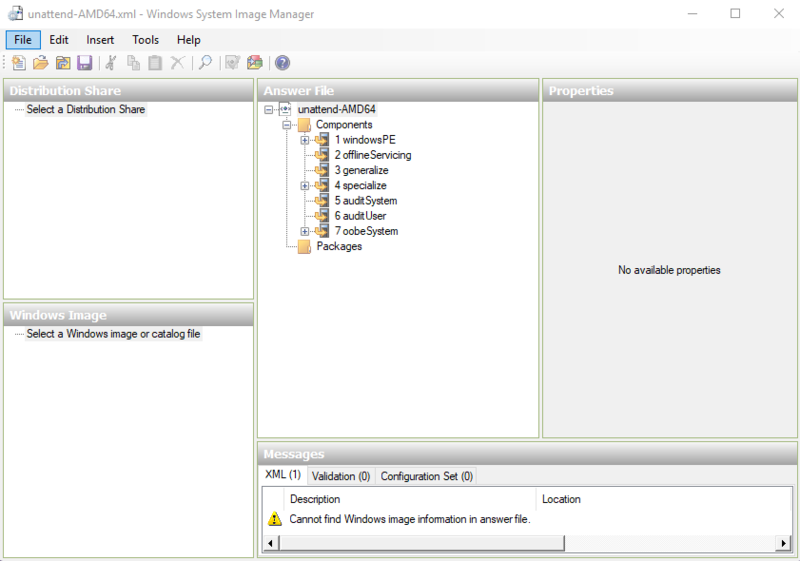 在程式集 Windows kits 點選 Windows System Image Manager.